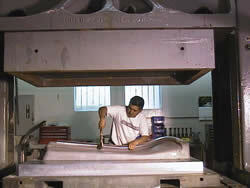 Hughes Bros. has two trapped Rubber boxes measuring 12" x 18" and 48" x 70", which can run various size simple tools. They can produce multiple parts at one time or complex shapes as illustrated. There is no tray depth limitatations as with a traditional Hydraulic press or bag press.The cycle time for manufacture is as fast as material can be loaded, formed and finished parts removed. 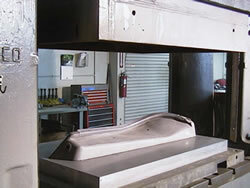 This process can be used on straight Hydroformed parts or for a finish operation for pre-formed Drop Hammer parts. See equipment list for additional sizes and specifications.